Some facts about the Blue Hen. College of Agriculture and Natural Resources' Blue Hens at the UD farm. 11:16 a.m., May 3, 2016--The University of Delaware’s flock of Blue Hens grew by three this year with the addition two males and one female  or two roosters and a hen. The birds were generously donated by Wesley Towers, a 1964 UD graduate who majored in animal and poultry health during his time at UD and went on to graduate from the University of Pennsylvania School of Veterinary Medicine and then serve as the Delaware state veterinarian for over 37 years. He is also a former member of the University’s Board of Trustees. The new Blue Hens join a flock that features descendants of birds that were originally donated by S. Hallock du Pont in the 1960s for teaching and research. Towers, who has raised Blue Hens since receiving birds that belonged to the late R.R.M. Carpenter Jr. after the death of the late UD benefactor, said that he has decreased the size of his flock over the years. When Bob Alphin, instructor in the Department of Animal and Food Sciences and manager of the University’s Charles C. Allen Jr. Biotechnology Laboratory, called Towers and asked if he had any Blue Hens that could be donated to the University, the timing was perfect. “I had sold all of the young ones except these two roosters and a hen, and I was getting ready to pare things down for the winter when Bob called and asked me if I had any. I said, ‘Yeah, you’re just in time. If you’d have called this time next week, they’d have been gone,’” said Towers. The Blue Hen flock at UD consists of about 60 birds that live on the College of Agriculture and Natural Resources (CANR) campus. The number varies, especially when new chicks hatch. “The first hatch this year I think we had about 60 or 70 chicks and then we’ll have a second hatch and then they’ll be grown out to a certain age, usually say in the range between 12 and 16 weeks. At that point then Karen Gouge [poultry farm manager] will select the best males and females that will become next year’s flock. Basically, we do our own breeding and produce our own breeders,” said Alphin. The flock had been genetically closed over the years and Alphin said that was one of the reasons he got in touch with Towers to see if he could introduce any new birds to the flock. “We’re limited to the genetics that we have within the birds on our farm. Even though we keep a large number of males as well as females to try to get as much diversity as we can, every once in a while, we like to try to find some Blue Hens that have not been part of our flock and we were very fortunate that Dr. Towers was willing to donate these birds,” said Alphin. Alphin said that the three new birds will be placed in a house with some of the best females from the UD flock so that the eggs that come from the group will all be different from the UD flock and will be hatched out separately. Paul Sammelwitz, an emeritus faculty member in the Department of Animal and Food Sciences who worked with the flock for 40 years until his retirement in 1999 -- and who also happened to teach Towers and Alphin as undergraduates -- said that the blue coloration in poultry is heterozygous, meaning that if a Blue Hen female is bred with a Blue Hen male, the results will be 50 percent blue and then 25 percent with a white splash and 25 percent black. Alphin said that most people are probably familiar with what’s called the “blue phase,” which is a steel blue color. In addition to being used for research and teaching, the birds along with other types of chickens raised on the UD Poultry Farm, are also used for outreach. They are featured at events such as Ag Day and are provided to non-profit groups like Ashland Nature Center. The eggs that the hens produce are given to local schools as part of the Cooperative Extension embryology program. 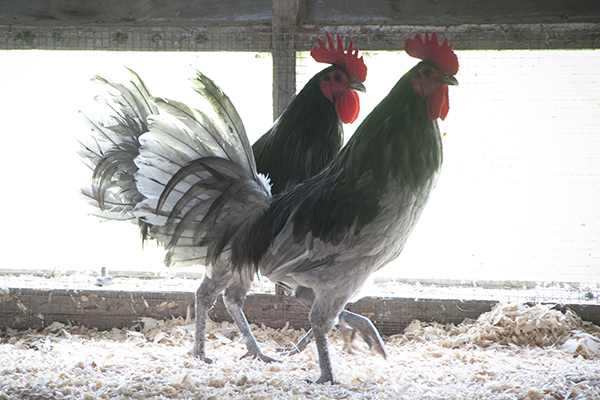 While Blue Hens come from English gamecock stock, it is not an officially recognized breed of chicken. It also has multiple origin stories linking it to the First State, one of the most notable being about a group of Revolutionary War soldiers from Kent County under the command of Capt. John Caldwell whose troops amused themselves by staging cockfights with a breed known as the Kent County Blue Hen, recognizable for its blue plumage. The name "Fightin' Blue Hens" has been used by University of Delaware athletic teams since 1911. The Blue Hen Chicken was named the official state bird by the Delaware General Assembly in 1939.